This week we have had several reports of Stagonospora glume blotch in wheat. This is a fairly common disease that is caused by the fungus Stagonospora (or Parastagonospora) nodorum. 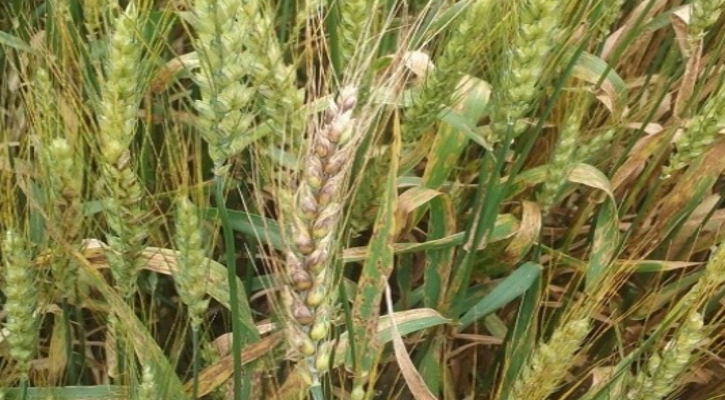 The fungus overwinters in/on previously infested wheat residue, and can also be found in infected seed. When conditions are warm and wet, the fungus will produce spores on the residue, which can be distributed within the field as well as carried over fairly long distances with wind. When a spore lands on a susceptible plant and conditions are favorable for disease (warm and wet) the spore will germinate and enter plant tissues. Lesions are produced a few days after initial infection. On leaves, lesions are lens shaped and bordered by narrow yellow halos. Foliage infected with Stagonospora will develop brown “cats-eye” lesions surrounded by narrow yellow boarders. After 2-3 weeks, spores can be produced from structures within these lesions, which can be distributed to uninfected tissues and fields. Glumes and heads can also be infected. Typically infected glumes are black to purple, and turn grey/brown over time, and eventually brown/black “dots” will be produced within lesions. These dots are spore-bearing structures. 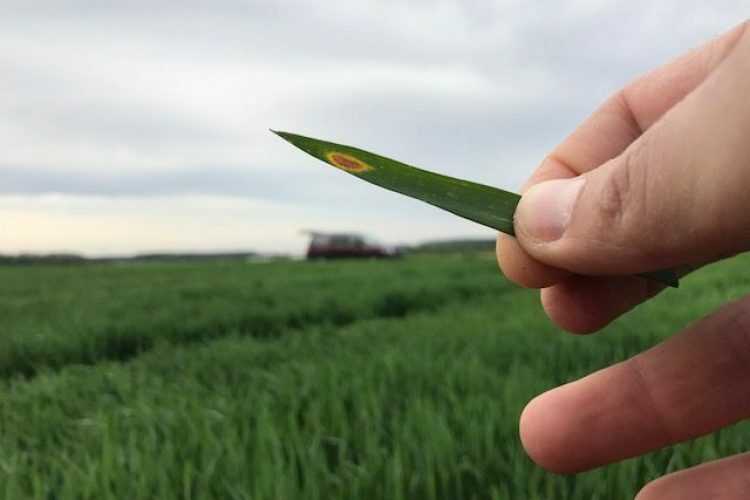 Symptoms on the head can be observed in the absence of foliar symptoms, although if foliar symptoms are observed early, it may indicate an increased chance for glume infections later in the season. 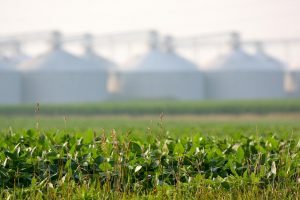 Yields can be reduced when plants are infected with Stagonospora, as the lesions reduce the amount of carbohydrates available for grain fill. Infected heads also will produce shriveled, lightweight grains and reduced test weights. Stagonospora glume blotch infections initially appear as black to purple lesions. Management of Stagonospora glume blotch starts with variety selection. Varieties differ in their susceptibility to this disease, and symptoms develop much more slowly on resistant varieties compared to susceptible varieties. However, resistance to the foliar and glume phases are not necessarily related. A variety may have excellent resistance to this disease in the foliage, and still be susceptible in the head, and vice versa. When selecting a variety, make sure you know if resistance ratings are based on foliar or head assessments. Residue management, such as tillage, can help bury residue and reduce local inoculum. 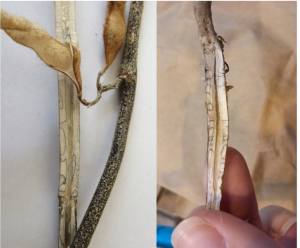 Fungicides targeted between flag leaf emergence (Feekes 8) through flowering (Feekes 10.5.1) are the most effective for controlling this disease. Applications made earlier (FGS 8) will not be efficacious for the glume infection phase. Fungicides used for managing Fusarium Head Blight (Caramba, Prosaro) are efficacious for this disease. Remember, fungicides will not cure existing infections (i.e. brown tissues will not turn green) but they can prevent additional sporulation and slow or even halt fungal growth. Whenever making fungicide applications, ensure adequate coverage and ensure that the product has at least 2 hours to dry before rain events.